Finally an online gaming platform that is all the card games we grew up with. Whether sitting at the table for an afternoon of family fun or playing with your school aged friends, card games are a common staple of entertainment. Rummy Royal is world full of ageless enjoyment. Although the homepage may really lack the allure, the concept of Rummy Royal more than makes up for the lack of luster in web designs. It’s not the main stream card games like poker that gamblers are accustomed to wagering on. Rummy Royal brings you back to your roots as you revisit a collection of memories at your kitchen table. You won’t need a pencil and a pad of paper to keep score or have added up the points several times to convince your opponents that you are indeed the winner. This is a unique concept that strays from the mainstream of stake card games. It is a refreshing approach to the classic standards in good old fashion gaming. Add a touch of modern technology of online gaming and it becomes a contagious playing field. Players won’t find an online site quite like this because Rummy Royal utilizes their very own software that shines with originality. Rummy Royal is licensed and regulated by the Government of Curacao. If you have a competitive streak this is definitely a gaming portal worth joining. Play up close and personal with other players at the live tables. What gives these card games an edge is the skill that is required. It is an ego booster to show off your fancy moves and strategies. For those players that are unfamiliar with any of the games offered, a comprehensive list of rules and strategies are available to help hone your game play. There are two variations of Rummy including Rummy 500 where the winner is declared once reaching 500 points collected from winning card patterns. Gin is a game quite similar to Rummy but with a slight difference, all cards are held and laid down all at once. Other card games that players may be accustomed to playing are Oklahoma and Canasta. 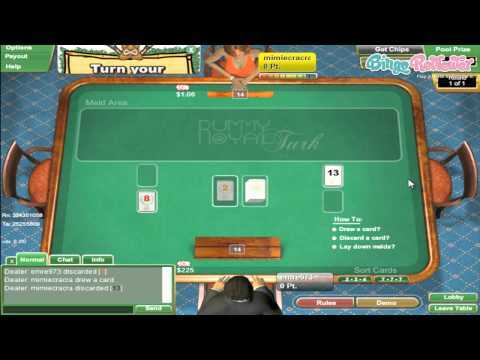 For more variations of Rummy you might want to try your hand at Burraco, Tripoley and Okey. For fast paced action it’s a must to play Kalooki 40 and Kalooki 51. Read the guidelines and tips for this enormously high charged card game. Get involved in some of the most compelling Tournaments and show off your competitive edge with Turbo, Speed, Guaranteed and Re-buy games. Welcome to Rummy Royal with a sweet No Deposit Bonus for all new players. A Welcome Deposit Bonus is waiting for all first time depositors. Give your card game extra playing power with more cash in your players account. Every day a Beginners Free Roll Tournament is available for newbie players. In addition special tourneys are offered for beginners. Players will find this under the Quick Tourney tab and the Rounds Tourney tab. Invite your friends to come play at the tables and when they make their first deposit get a $50 bonus and your friend will receive $25. What not a better gift for two friends to share than an offer where both benefit. Check the Ongoing Promotions page where exciting specials are offered. Challenging games are waiting for you in some of the most creative promotions for compelling completions. There is no doubt that this site is different from any other for placing stakes on unique card games. Including promotions that are perfect for the competitive streak in gamblers makes it all that more exciting. We rate Royal Rummy with 3.75 Pink Hearts. Everybody judge the site by its look, well, at least at first. Rubby Royal didn't score high in my book, and it doesn't look quite nice. In order to play the games, you have to download the software first, and that means PC's only. No Mobile site version, which is a shame, since there are a lot of new sites that offer it. There is no Bingo on this site, just good old card games, which is something you could have guessed. I was happy to see the No Deposit Bingo offer, a starting deposit 100% bonus, various Freerols, and a lot of other different promotions. Still, that is not really impressive and I have seen much better promotions. If you do appreciate card games, like Rummy and some other classic variants, you will love this site simply because there are very few other that have anything similar.